On Tuesday, 5 February 2019, President Trump gave his second State of The Union Address. As you may have heard, the SOTU was delayed this year by Nancy Pelosi due to Donald Trump's shutdown of a large percentage of the U.S. federal government. 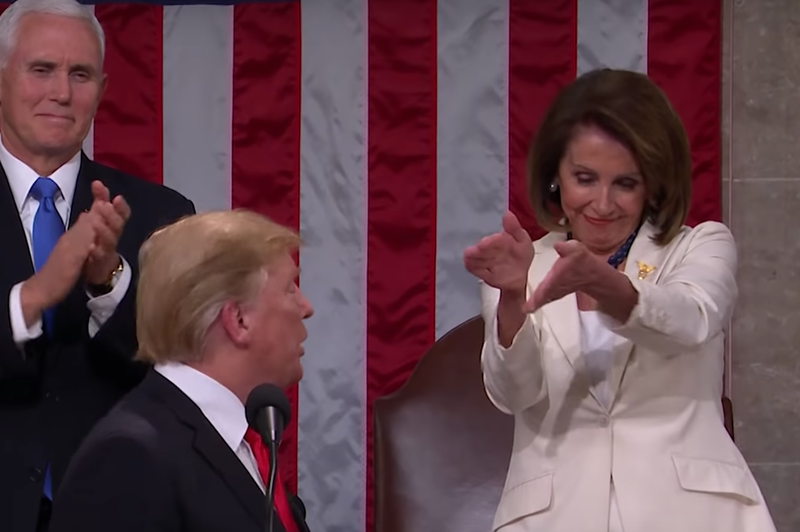 And via her body language, Nancy Pelosi very much continued to steal the show. What follows is a partial nonverbal analysis of a brief but profoundly impactful portion of Pelosi's nonverbal exchange with the President during the 2019 SOTU. DONALD TRUMP (continuing from 0:09 in the above video): But we must reject the politics of revenge, resistance, and retribution - and embrace the boundless potential of cooperation, compromise, and the common good. 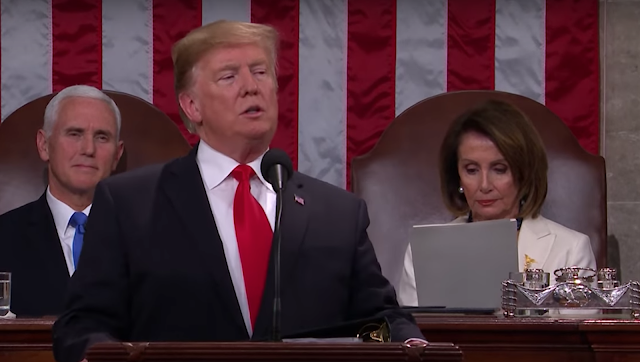 Throughout much of the SOTU (this image from 0:13), Nancy Pelosi repeatedly looked at her copy of the President's address. In so doing, she was showing to the world her deliberate disrespect toward Trump. 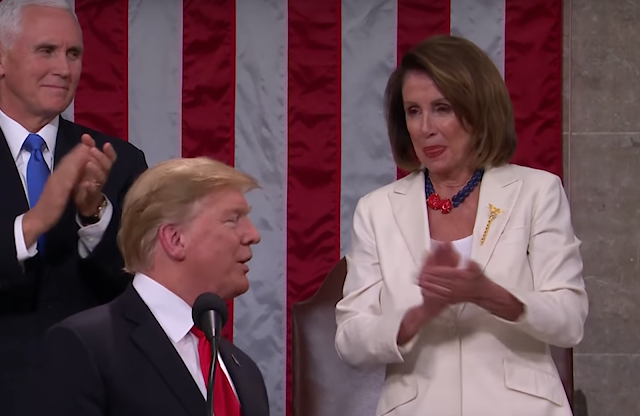 Pelosi's lack of eye contact and diminished attention telegraphed her refusal to subordinate herself - and by extension, her refusal to subordinate the American people - to Donald Trump. 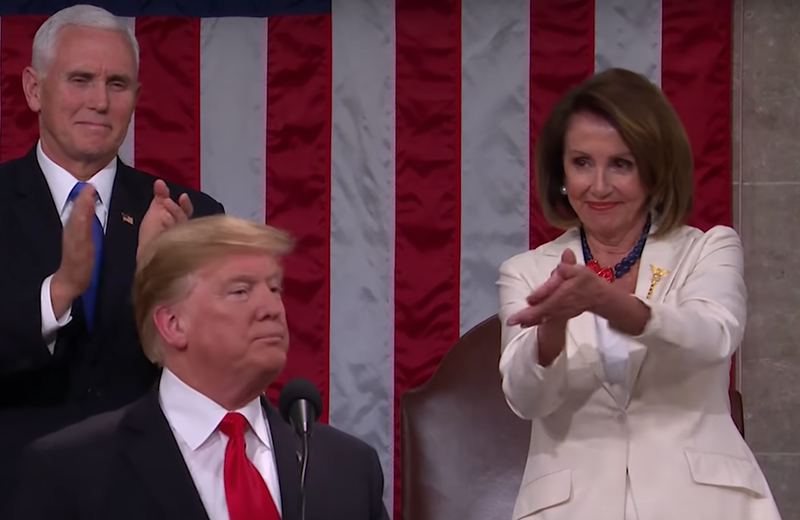 Nancy Pelosi's clap is distinctive and important for several reasons (0:28). Note how her hands and fingers are flattened - fully extended (and even mildly hyper-extended - e.g., with her fingers bending a bit outward at their tips). 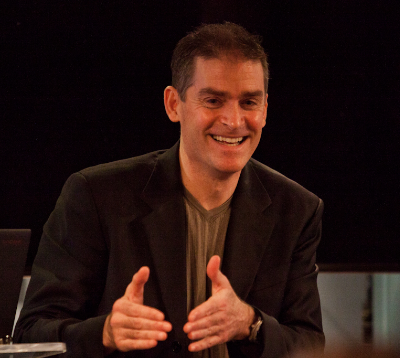 The long axis of the hands are also close to parallel. 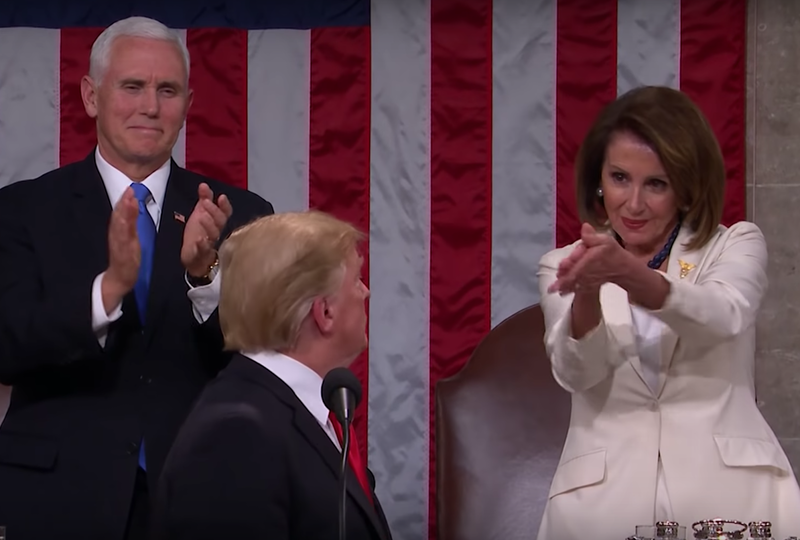 Typical enthusiastic and sincere clapping involves hands which meet each other at more of angle (e.g., as are Pence's hands in this same moment) - as well as with hands and fingers that are cupped. Such configurations engender significantly louder noise whilst clapping. Pelosi's arms are also extended and elevated - and her shoulders are hunched as well. This cluster dynamic prevents the generation of power during clapping (ergo, it's quieter and projects less enthusiasm). Moreover, the Speaker's torso is leaning away from Trump - thus distancing herself from a person whom she does not like. Donald Trump Turns - and for two seconds (0:29 - 0:30), Nancy Pelosi locks eyes with the President. 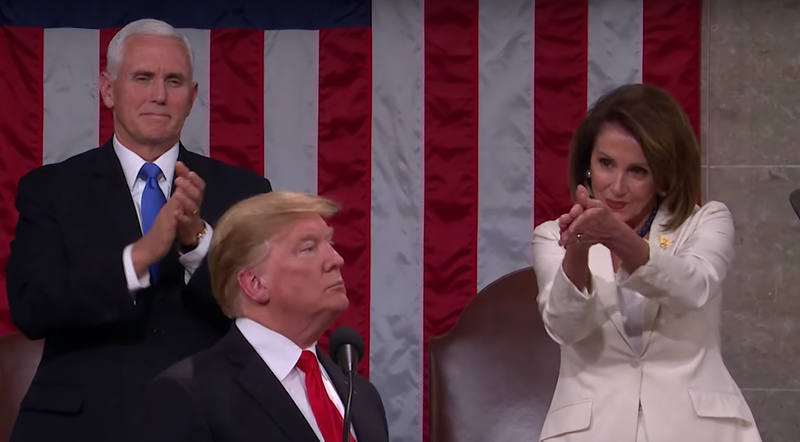 • Pelosi's lips are pouting - indicating a sarcastic, "Donny's been a good little boy - let's all clap for him" message. Less than a second later (still during 0:30), Donald Trump says something to Nancy Pelosi as she looks down and away from the President. During 0:31, Donald Trump is rotating away - back toward his audience. As he does so, Nancy Pelosi looks at him again. The Speaker of the House has a Disgust-Pseudo Smile expression, while the President has a Disgust-Defiance facial amalgam. 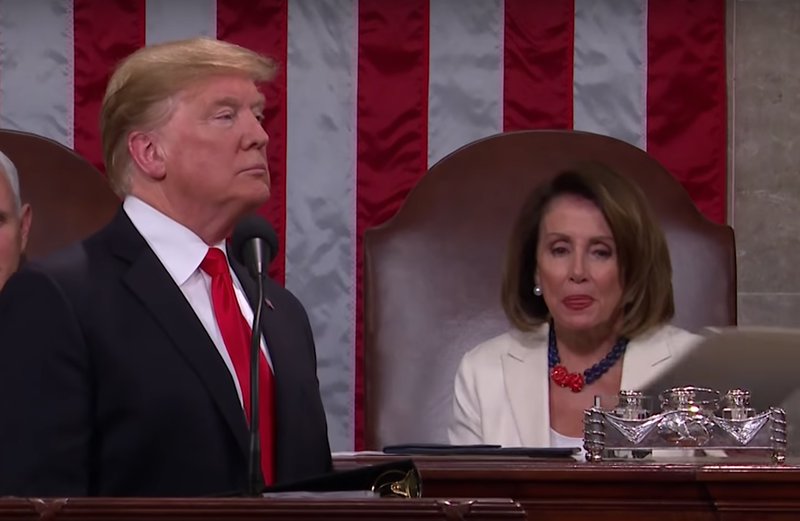 Trump then turns briefly back toward Pelosi (0:34), speaks briefly once again - as we see another Tight Tongue Jut displayed by the Speaker. From a body language perspective, it's surprising and ironic that both the Vice President and the Speaker of The House are traditionally placed above and behind the President during the State of the Union Address. Both of these positions temporarily give the two subordinate officers greater alpha status. Many alpha males, in particular, have great difficulty with others standing behind them. It intimidates them and makes them feel vulnerable. Donald Trump has a history of misogyny - and here, with his current chief political rival and the first woman who has ever enforced significant power over him - he finds himself out of his element. 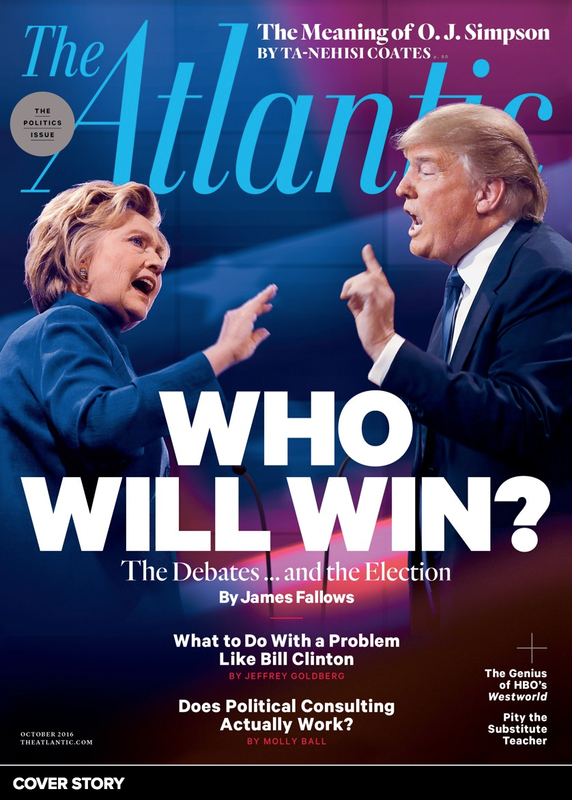 SUMMARY: Donald Trump did not read this moment for what it was - a very public, sarcastic, condescending, and patronizing dissing. After preventing President Trump from delivering his second SOTU address in January - the Speaker of the House threw some major shade in February. 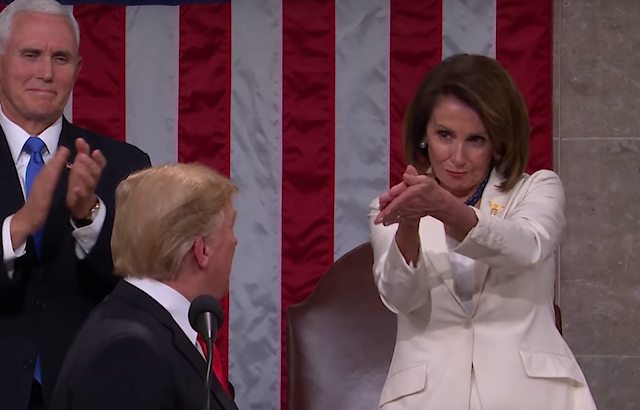 Without speaking - even speaking a single word - and armed with her wits and nonverbal skills, Nancy Pelosi's classic Clap-back exacted a body language coup d'état upon Donald Trump. Body Language Analysis No. 4371: "Mr. President ... have you ever worked for Russia? Yes or no?"